So this is where the black metal sidewalk ends. Drenched Lands, the first full-length CD recorded by Chicago's Andre Foisy and Terence Hannum as Locrian, employs few tools -- a guitar, some electronics, synthesizers and effects pedals. The album dovetails with traditional black metal only peripherally, with muffled screams occasionally emitting from abyssal noise drones. Otherwise, it's all ambience and curious tones. 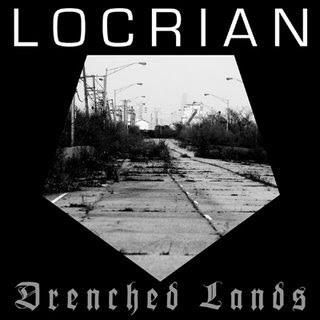 Space and quietude pervade Drenched Lands, and yet Locrian's unsettlingly sparse soundscapes are heavier than most doom epics. "Barren Temple Obscured By Contaminated Fogs"
"Obsolete Elegy in Cast Concrete"
On the cover to Drenched Lands, black metal's pentagram becomes a pentagon encapsulating a barren, cracked street. The image conflates magick's astral planes with the mundane terrors of urban decay. It's a metaphor for Drenched Lands, which voices the desolation of downcast glances, unplugged amplifiers, empty parking lots. A church bell tolls solemnly in "Obsolete Elegy in Cast Concrete;" a lone guitar smears a crackling un-solo. That could be "Taps" writ in guitar feedback. Is it more frightening to wonder whether there's something's lurking around the corner, or to know that nobody will ever appear? Locrian posit the latter. We have all felt the emptiness at the heart of these pieces. What's heavier than reality?